Fr. Cekada recently released a juvenile video on Sedevacantism called “Stuck in a Rut,” which he dresses up with humorous caricatures and comical satire (techniques he commonly uses to camouflage the weakness of his own arguments). In the video, Fr. Cekada makes an embarrassing blunder when he attempts to use canon 151 from the 1917 Code of Canon Law to explain away the teaching of the theologians who teach that a declaratory sentence of the crime is necessary for a Pope to lose his office for heresy. Fr. Cekada actually wants his followers to believe that when the theologians speak of a declaration of the crime, they are merely referring to an administrative declaration the Church makes which announces that the office is already vacant by law (but being illegitimately occupied). Obviously, Fr. Cekada has put the cart (the administrative declaration of vacancy) before the horse (the determination of the crime that gave rise to the vacancy in the first place). Any administrative declaration by the Church under canon 151 (to remove an illegal occupant) must be preceded by a judgment of that same authority establishing the basis for the removal (e.g., the crime of heresy). The example of an eviction notice after a real estate foreclosure will help to illustrate Cekada's error. In the cases of both ecclesiastical office and real estate, the underlying cause (e.g., crime/debtor default) that gave rise to the loss (office/property) has already been adjudicated by the proper authorities (the Church/secular court). Unfortunately, many unread and gullible followers fall for Fr. Cekada's ostensible erudition, which is easily unmasked when you dig just below the surface. 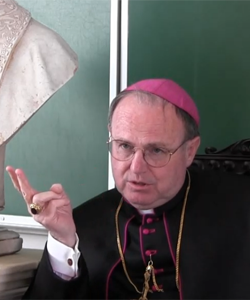 Even Sedevacantist Bishop Donald Sanborn (left) rejects Fr. Cekada's novel theory.